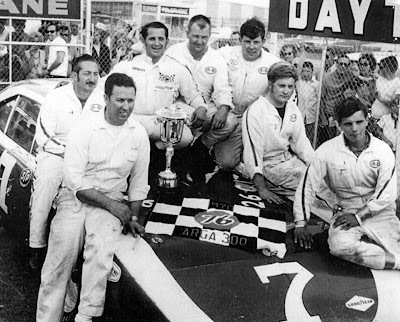 Daytona Beach, Fla. (February 15, 1970) - Ramo Stott won the race, but the stars of the show were 54-year-old Iggy Katona, dean of America’s professional auto racers and A. J. Foyt, three-time Indianapolis 500 champion. The stage was the seventh annual ARCA 300-mile stock car chase at Daytona International Speedway on Sunday. The audience totaled about 27,500. Stott, 33, of Keokuk, Iowa, muscled his winged Plymouth “Superbird” across the finish line three car lengths ahead of a Dodge of similar design driven by Bobby Watson of Prestonsburg, Ky., to win the $5,900 first prize money. Katona, a grandfather who doesn’t allow any grey to show in his black hair, was leading the race by what appeared to be a safe margin, and with only seven miles to go, when a tire blew on his Dodge and put him into one of the wildest spins of his 25-year career as a racer. Watson and Stott, who had seen chasing Katona around the Daytona tri-oval at 185 miles an hour, managed to avoid the accident and the wily Stott roared into a lead which he stubbornly held until the finish. Third place went to Ron Grana of Farmington, Mich., while Louis Wusterhauser of Austin, Tex., claimed fourth and Katona was credited with fifth place. Foyt, along with his USAC stock car owner Jack Bowsher of Springfield, Ohio, and Herb Nab, crew chief for big NASCAR winner Lee Roy Yarbrough, were working in Wusterhausen’s pit. At about the 175-mile mark Wusterhauser headed his 1969 Ford down pit road, apparently in response to a signal from his crew. But suddenly Foyt jumped over the pit wall and held up a “go” sign to his driver and the ex-cowboy and rodeo performer roared off again without stopping. When he reached the end of pit road, he appeared to ignore a steward’s signal to stop. Two laps later Wusterhausen was black-flagged to the pits for consultation with officials, which led Foyt to collar NASCAR Steward John Bruner Sr. The two argued heatedly for a couple of minutes while Wusterhausen sat helplessly in his car listening. Bruner penalized the Texas driver a lap for the pit road infraction and allowed him to continue. But Foyt continued to argue his point - that there was no violation - and finally was pulled back behind the pit wall by Bowsher.